In the first game of the double header at Cherokee, Walton Varsity wins 13-4. Strong pitching by Bobby Spencer with 5 IP and 5 strike outs, and Seth McBrayer closing out the final 2 IP. On the hitting side John Giesler had a grand slam HR, and Seth McBrayer, Brandon Nikitaides and Bobby Spencer led the team with 2 hits each. Walton lost a close second game 6-4. It was a great opportunity to see a lot of the future varsity players get some game action. The future of the Walton baseball program looks bright. Walton Varsity finished the regular season 19-9-1. 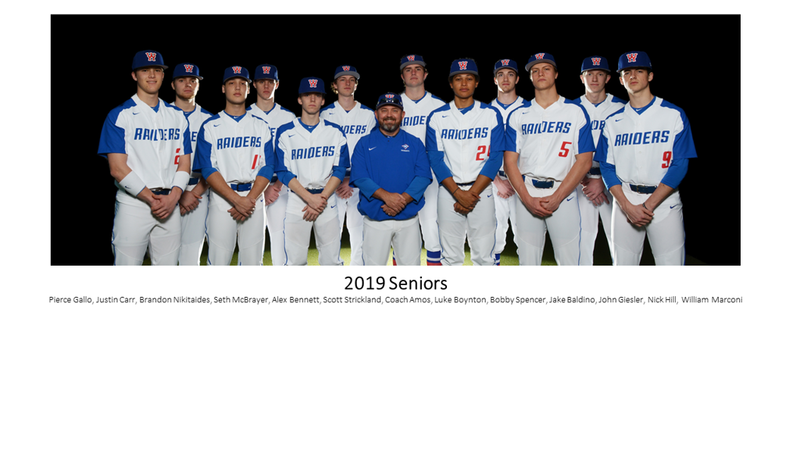 Playoffs will start Wednesday April 24th with a double header at Raider Mountain, opponent to be determined. Walton Varsity wins the region with 6 - 0 score over Cherokee in the first of a three game series. Will Marconi lead the Raiders on the mound with 5 IP and 7 strike outs. Oliver Wood closed out the final 2 innings allowing 1 hit while striking out 1. Bobby Spencer, Luke Boynton, Justin Carr and Brandon Nikitaides each collected one hit. The final two games of the regular season will be at Cherokee on Wednesday April 17th. The first game of the double header will start at 5:00pm.